Our own writing coach Gabriel Periera is coming off the high of her recent TED talk (yes, she’s done an actual TED talk) with some new ideas on how to stay motivated and move forward with our writing goals. If you’re looking for ways to maximize your results and productivity in the next few months, read on for some helpful tips. It’s that time of year when people are making—and breaking—New Year’s Resolutions. If you’re like me (and many other writers), you likely struggle with making room for your writing or getting past writer’s block. In fact, when preparing my recent TEDx talk on the craft of creativity, I came up against these same obstacles and realized that the solution is simple: just sit down and do the work. But just because the answer is simple doesn’t make it easy to execute. This is why, as you gear up to tackle your writing goals in the New Year, it’s good to have the right tools and resources at your disposal. Here are three things you need in order to reach your creative goals. Most writers write because they love it, because they can’t not do it. But have you ever stopped to think—really think—about why you chose writing over all the other possible creative outlets you could have? Think back to the time when you first started writing for real, not just doodling or jotting down notes, but writing something that was meaningful to you, that you felt had impact. For me, that moment was in elementary school when I would sneak away during recess and hide in an empty classroom, jotting down stories and writing plays in a battered composition notebook. While most teachers might have been delighted that a student was writing during recess, my third grade teacher did not approve and she even relegated me to a remedial English class because of my uncooperative and non-conforming behavior. Looking back I realize now that for most young writers, this would have been heartbreaking, but for me it was the lighting of a fire. From the moment that teacher labeled me as a “problem” and told me I was “no good” at writing, I became determined to prove her wrong, and that defiant urge has spurred me on ever since. A mentor of mine once told me: “When you’re in competition, the one with the biggest WHY wins.” I think there’s truth to that and if you know why writing matters to you, you’re more likely to dedicate the time and energy to it that it requires. 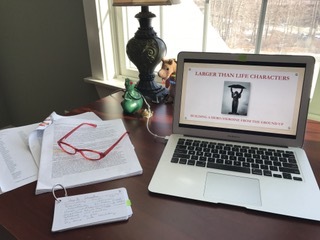 Finding time and building discipline are among the most common challenges writers tell me they encounter, but if you give yourself a structure or a routine, it becomes much easier to get past that obstacle. When I created DIY MFA years ago, I did so because I wanted to keep up the same structure that a traditional MFA program had given me. I was secretly terrified at the prospect of graduation and I wanted some way to keep that momentum going. When I was writing the book, DIY MFA, again I relied on my routine to keep myself on track. This time it was the regular schedule of squeezing in my writing between when I dropped my son off at preschool and when I had to pick him up a few short hours later. Having a regular routine made my writing non-negotiable and a no-brainer. I didn’t have to stop and think, “When will I do my writing today?” I knew when because it was the time I did so every day: between 9:00-11:30, while my son was in preschool. Not having to think about it meant I wouldn’t question it, I would just sit down and write as though it were any other job. When you’re embarking on a new and ambitious goal, a strong community can be game changing. Yet for many writers, community can be one of the most difficult things to find, often because they’re looking for the wrong thing. Most writers think community is first and foremost about getting other writers to read and critique your work. While critique is certainly one benefit of a writing community, I recommend starting with building friendship and trust first. Accountability and support are two big benefits of finding a community. By sharing your goals with fellow writers or even sitting and writing side-by-side, you’re more likely to stay focused and put in the legwork to reach your goal. In terms of support, that can be either personal—like getting the emotional support you need—or professional. The latter can include anything that opens doors for your creative career, such as advice from a mentor, an introduction to a key influencer, or other opportunities. I often recommend that writers start by looking more for accountability and support, as critique partnerships require a certain level of trust that takes time to build. My most trusted readers are ones whom I connected with as friends first, then eventually asked for feedback on my work. The WHY is unique to the individual writer, and the only way to discover it is by doing some deep soul-searching. The structure and community, on the other hand, are much easier to find and you don’t have to come up with them from scratch. In fact, we have an event happening at DIY MFA right now that can help you both with developing a structure for your writing and finding a community. This event is the DIY MFA Book Club and you can sign up for free just by clicking the link and entering your email address. Part writing challenge and part read-along, the Book Club is a chance to learn and apply signature DIY MFA concepts and connect with like-minded writers in the process. Every few days, you’ll receive a writing prompt via email to help unleash your creative momentum and get your writing. Want to join? Click here and sign up! 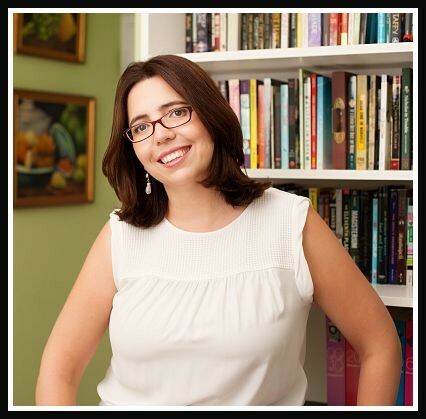 Gabriela Pereira is the founder of DIYMFA.com, the do-it-yourself alternative to a Masters degree in writing. She is also a speaker, podcast host for DIY MFA Radio, and author of the forthcoming book DIY MFA: Write with Focus, Read with Purpose, Build Your Community (Writer’s Digest Books, July 2016). Join the word nerd community at DIYMFA.com/join. This entry was posted in Focus, Goal and Milestones, Motivational, Writer's Block. Bookmark the permalink. It is such a great idea! She’s a smart lady and it is a great way to work with writers! I got straight As in English all through school but when I went to college, they put me in the lowest Reading class. I think it’s because I don’t test well. I thought my dreams of becoming a writer were a long shot because of it. I was determined to prove them wrong though. It is so sad how sometimes educators, the people who should nurture, sometimes don’t. I am so glad you didn’t give up! OH my gosh, I just bought her book. I love this post! I have learned so much from this blog… go glad I took the plunge and decided to look for good solid help in my writing! This blog, DIYMFA, One Stop have made me excited to finish my book! This is great advice at just the right time (for me especially!). And I have to say I LOVE the idea of the book club–what a great way for people to be able to really be able to dig deep into the teachings of your book. I hope LOADS of smart writers join up – it sounds like an excellent way to shorten the learning curve considerably!